Welcome back to the December of 1989! 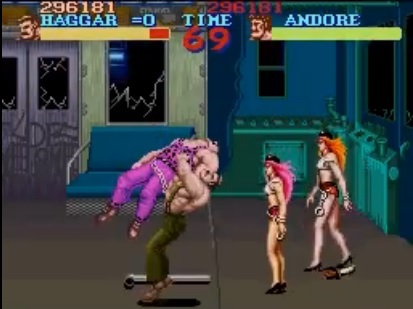 Back when Capcom released Final Fight, a new beat’em up using the 16 bit technology of their CPS I arcade board and providing a fun journey to the fictional “Metro City” where the Mad Gear Gang is terrorizing the city and kidnapped the daughter of Metro City’s Mayor, Mike Haggar..a former professional wrestler who can send his opponents with Suplexes, Piledrivers and Clothelines to hell! Beside Haggar, the player can also control his friends Cody and Guy which use very different fighting styles, its also possible to play the game together with a friend which was and is even more fun. Final Fight’s protagonist were interesting already, but the stage bosses and also enemies like Roxy, Andorre and of course Poison spiced up the game even more. Especially Poison, known as the first transsexual video game character ever, is quite popular among video gamers who know fighting games. Together with Hugo, a member of the Andorre family she is going to be in Ultra Street Fighter IV in 2014 even. Final Fight and Street Fighter play in the same universe, since Street Fighter Alpha in 1995, around 7 Final Fight characters made it into Street Fighter games. Final Fight was released in December 1989 on the CP System arcade board and designed by Akira Yasuda more known as Akiman and Akira Nishitani. It was ported to the Super Nintendo as one of the launch titles. The English versions of the game were heavily censored with Roxy and Poison being removed from this version completely due to technical limitation the 2Player mode was gone as well, Guy was gone there as well. Final Fight got later in 1991 ported to multiple home computer systems, a MegaCD version was released in 1993 which featured an arranged version of the soundtrack and also new voice acting. The last remake of the game was released in 2001 for the Game Boy Advanced which featured new graphics, was again partially censored and added Street Fighter versions of Guy and Cody as unlockable characters. Today in 2013, Final Fight is available for almost every bigger platform in some form, personally i recommend the port seen in the Capcom Classics Collection Vol. 1 for the Playstation 2 which features tons of concept and promotional art as unlockable items as well as sound effects and tracks from the game. This is the first Final Fight Series related featured Fan Art as part of the Blast of the Past Articles.